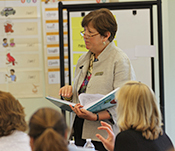 Wilson Language Training® offers professional learning options designed to help educators develop practical skills and enhance implementation of our programs: Fundations®, Just Words®, and Wilson Reading System® (WRS). Parents who want to learn more are welcome to register for our training as well. The first step in professional learning is attendance at a workshop/course for the selected program. Workshop/Course Offerings are scheduled by Wilson Language Training (WLT), as well as Wilson® Accredited Partners, at locations throughout the country. Participating in authentic Wilson® professional learning, offered through WLT or our authorized providers, ensures that you receive our high-quality, practical instruction which supports program fidelity. For continued development, teachers may want to pursue WRS Level I Certification and WRS Level II Certification. We strongly recommend that students needing intense remediation with the Wilson Reading System receive instruction from a WRS Certified Teacher. WRS Certification can also be helpful to those implementing Fundations or Just Words to build a stronger understanding of the principles on which all of Wilson’s programs are based. Those who participate in Wilson’s professional learning workshops and coursework receive access to the corresponding program’s online Learning Community which provides additional resources and support for ongoing success. For schools and districts implementing one of Wilson’s programs, professional learning for a group of educators is encouraged. On-site development in collaboration with Wilson’s expert team provides the opportunity for educators to develop their skills and understanding in the use of the selected program(s), and builds a culture of fidelity and sustainability in their school and district.